Sometimes, a new food-related idea is so bizarre, so out there, and just so strange that it overcomes all odds and winds up being incredible. However, it usually just winds up being gross. 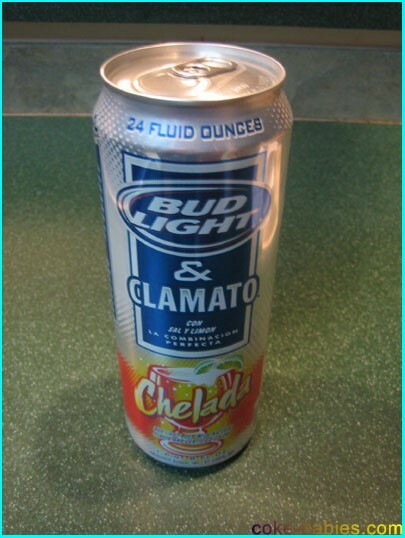 When an idea such as a can of beer mixed with Clamato comes along, which category will it fall into? Anheuser-Busch seems to think it has its finger on the pulse of society, what with their poignant advertising and general “Hell yeah, America!” attitude. To think this is all they are about would be to miss just how open minded they really are. For instance, did you know that Budweiser products are being marketed to other cultures? It’s true. Not only does Budweiser want to be the main source of ice cold refreshment at your next party, it also wants to be the main source of ice cold refreshment at your next fiesta. That means “party” in Spanish! In order to get its foot in the fiesta door, they have just released (okay they did this a long time ago but I’m writing about it now, so for our purposes it is “just released”) their take on a classical Mexican beverage. I did my research (browsed Wikipedia) on the drink known as the Michelada, and it seems to have a rich history (the Wikipedia entry had more words than I was expecting). The bottom line is mixing beer with tomato juice is the base for making a Michelada, but apparently they can’t be considered a true Michelada unless it contains Worcestershire sauce. It goes into some grey areas at that point which is when, admittedly, I started to tune out. When I saw the can on the shelf I remembered why I was so hesitant to try it. 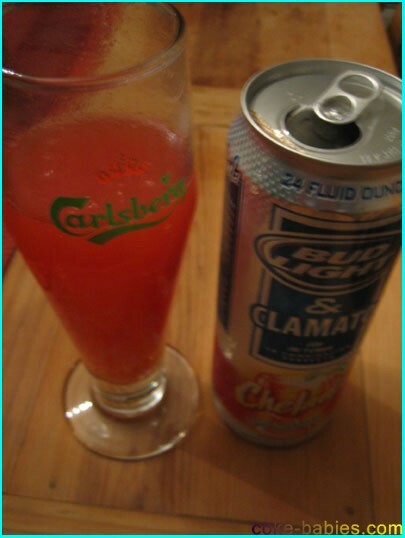 It wasn’t just beer mixed with tomato juice, it was beer mixed with Clamato. The very concept of Clamato creeps me out. What is it, tomato juice with clams in it? That was always my assumption of what it actually was, although I have also heard that it was basically just tomato juice, and happened to have “clam” in its name. This is not meant to give you the impression that the vast majority of my conversations with people are about tomato juice (only about half of my conversations are). This is more meant to show that my opinions about something I don’t really care about can be easily swayed by hearsay and conjecture. Finally, I decided to research what Clamato actually is. According to my findings (source: Wikipedia.org), the main ingredients of Clamato are: tomato juice and reconstituted dried clam broth. There you have it. Clamato is not just a disturbing product name, it actually does contain clams. And yes, I do feel a bit stupid being shocked by that fact. Since the product does indeed have “clam” in its name, it should be assumed. I simply wanted to believe that something like that just couldn’t exist. 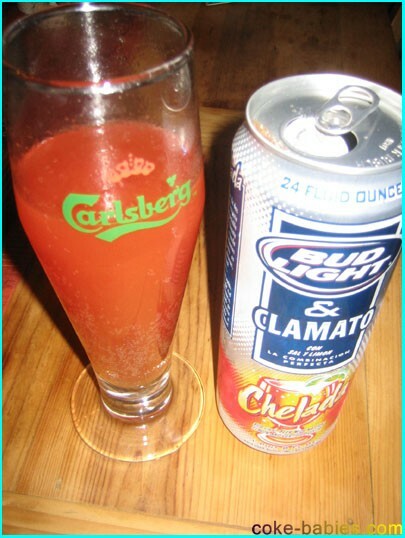 The success of Clamato has led to the introduction of several imitation beverages, usually marketed as tomato-clam cocktail. The generic beverages are often considerably cheaper than Clamato and have cut into Mott’s market share. Mott’s has taken steps to protect its trademark, running print, radio and television advertisements which attempt to distinguish Mott’s Clamato from generic tomato-clam beverages. Apparently, getting in on the tomato-clam beverage market is such a lucrative opportunity, some companies are committing clam-based subterfuge to trick people into buying their non-Clamato clam-based beverage! Scandalous. Also, if you can not think of a single piece of advertising to come from Mott’s Clamato ad campaign, you are not alone. On a related note, I think adding the phrase “clam-based” before any noun instantly makes it more intriguing. Finally, the waiting was over. Armed with my can of Bud Light & Clamato “Chelada”, along with my now surprisingly large amount of Clamato knowledge, I was ready. Despite the fact that pouring anything Bud Light related into a glass seems like a waste of a clean glass, I decided that was the proper testing method. Mostly because I wanted to get a picture of it. As you can see, my photography skills are as strong as ever. With the flash, the Chelada looks like some sort of carbonated, watered down tomato juice. So hey, my picture gets the point across. Although without the flash, it looks like a Shirley Temple (which would be one huge shock to the system if that’s what you were expecting when you took a sip). The beverage’s smell was what you might expect: watered down tomato juice. I feel bad for possibly overusing the phrase “watered down tomato juice”, unfortunately when I looked that up in the thesaurus, no synonyms could be found. Even though the drink didn’t smell that good, the important part is the taste. And the Chelada’s taste was… surprisingly bad. Not bad in the way you might be expecting. It didn’t taste like Manhattan clam chowder, nor did it taste like rancid beer. It just tasted like (wait for it) watered down tomato juice, with some carbonation and strange background flavors to round out the unpleasant mix. I may have been expecting a thicker texture going into it, and the more beer-like consistency threw me off. I guess the thinner texture of the drink would make it more “refreshing”, but it just seemed strange to me. Although I don’t know what ratio of tomato juice to carbonation wouldn’t be strange. The end result of the taste is that it didn’t seem to be enough of anything. There wasn’t much tomato flavor, and there wasn’t much beer flavor. It was just sort of there. If Anheuser-Busch is looking to push Cheladas for the upcoming summer season, I would be open to listening to deals to use my “Just sort of there.” review in their advertising. I would even be willing to allow them artistic license and add an exclamation point at the end of the quotation. For your next fiesta, I don’t think I can recommend a Budweiser Chelada. I can, however, recommend a much cheaper alternative: ketchup, beef bullion, and Fresca. Its zestiness will blow you away.